Can the District Government Maintain It? 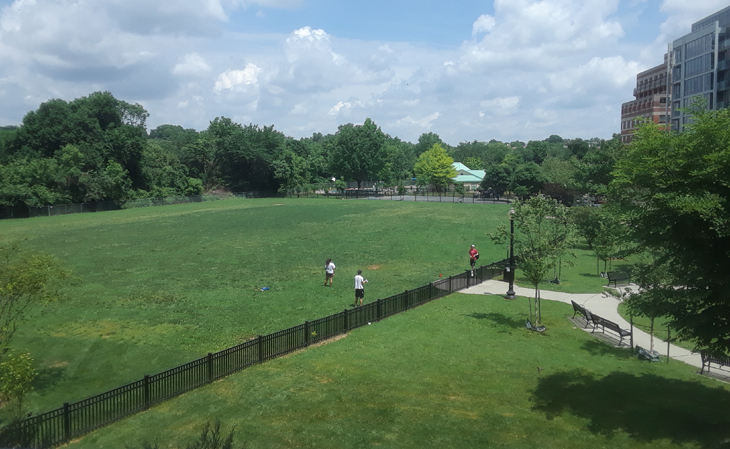 As shown in the photograph below, taken from the second floor of 2501 M Street on May 27, 2018, Francis Field has responded well to last summer's planting of grass and its temporary irrigation. It is not a perfect, country-club lawn. Many species of grasses and other natural plants are living on the field. During the experimental planting that Friends of Francis Field (FFF) organized and financed last summer and fall, no weed-killers or herbicides were applied, and native species—often known as "weeds"—were allowed to grow. The result has been a field restored to horticultural life, with a safer, softer green playing field. From June to October 2017, FFF hired a private contractor to apply seed and fertilizer under National Park Service specifications. An experimental, temporary irrigation system was also instrumental in getting grass and native species to grow. Compare the condition of the field as shown in photograph at right, taken in the winter of 2017, before FFF's the experimental planting and irrigation began. This image is from District government's Geographic Information System which uses aerial imaging and Esri (Environmental Systems Research Institute) software. The large and perennial bare dirt center of the field shows clearly in this image. To achieve a "greening" of the field as shown in the May 2018 photograph above, the field was closed by DPR to sports teams and other uses from June 19, 2017, to March 17, 2018. As described and illustrated in our October 2017 report, the packed-down central field area was first decompacted. Then grass seed and organic fertilizer were applied. Lengths of wooden "snow fence" were erected on the field to discourage unauthorized sports use and allow the grass seed to germinate and grow. A portable system of sprinklers on timers provided temporary irrigation. Many observers commented last summer and fall that they had never seen Francis Field look so green. This can also be substantiated by viewing the photographs of the field in the Neglect article on this website, which shows field conditions over two decades. The success of this private greening effort raises the question of why the District government and the private contractors it has hired over the last seven years have been unable to maintain the field adequately. Contracts for the maintenance of Francis Field, which included the reseeding of grass, fertilization, and aeration, have been awarded by the Department of General Services (DGS) since 2011. An examination of the contacts and maintenance schedule is underway. The FFF board of directors has voted not to spend additional private funds on the field until it can be determined why the maintenance work being contracted for is not able to maintain a safe, green, and live playing field. Good rainfall in mid-May has also helped to "green" the field. All of the 43 new trees planted in May 2017 by FFF, the Casey Tree Foundation, and other volunteers, appear to be thriving. Shown in the photograph below is one of the new Redbud trees in bloom. This was taken on April 18, 2018. (See also the Tree Planting article on this website, for details. 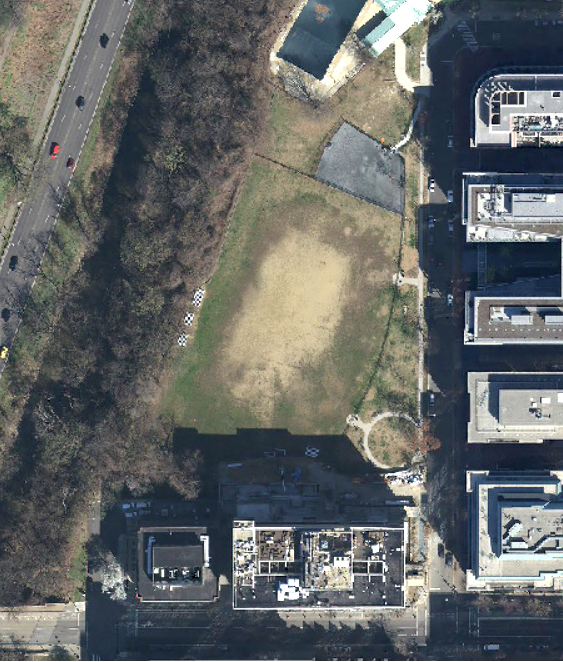 The field has been subjected, since March 19—two months time—to a great deal of permitted play by large groups, as described on another article on this website (see Over-Permitting). FFF is attempting to work with the District government to achieve some equilibrium between the heavy use of the field permitted by DPR and the maintenance provided by DGS.